Nuevo Lardeo, Tams in Mexico is a part of the Logistics Plus® network. This office provides LTL and truckload brokerage, air and ocean freight forwarding, warehousing and distribution, project cargo, import/export, and global trade compliance services. Nuevo Laredo is a city located in the Municipality of Nuevo Laredo in the Mexican state of Tamaulipas. The city lies on the banks of the Rio Grande, across from the United States city of Laredo, Texas. Both the city and the municipality rank as the third largest in the state. The city is connected to Laredo, Texas, across the Rio Grande (Rio Bravo) river by three international bridges and a rail bridge. The city is both larger and younger than its U.S. counterpart. It is the largest inland port in Mexico, just as its counterpart across the border is the busiest inland port(bridge crossing) in the United States. 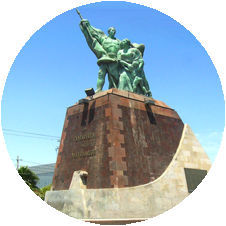 As an indication of its economic importance, one of Mexico’s Banderas monumentales is located in the city (these flags have been established in state capitals and cities of significance). Nuevo Laredo is also home to a Logistics Plus office where we proudly serve both small and large businesses throughout the region. If you’re located in Nuevo Laredo, or any other surrounding community, your friends at Logistics Plus are ready to provide you with local, domestic, and global transportation and logistics services. Additionally, we’ll show you how our people in Mexico put the “plus” in Logistics Plus by doing the big things properly, and the countless little things, that together ensure complete customer satisfaction and success!